With only 12 weeks of planning the new BPM show organisers really pulled it out of the bag, with a super successful show for all involved. Very much reminiscent of the earlier BPM shows at Donington Park, this years’ show focussed very much on mobile DJs, and with a new venue, new layout and new team behind the scenes they were definitely gearing up to be the show of the year! 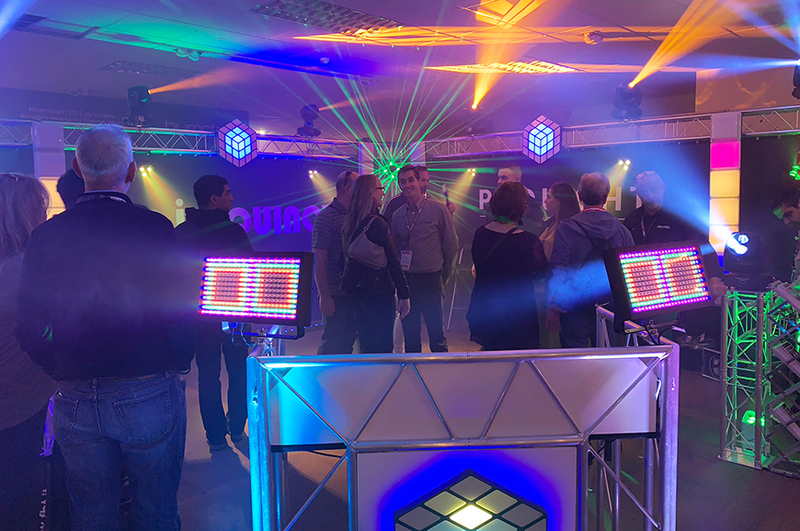 To support this new direction we, the Prolight Concepts Group, made sure we streamlined our product offering and stand layout to truly cater for professional mobile DJs, with particular focus on our popular Equinox and LEDJ brands. The 2-day show at Cranmore Park, Solihull had a footfall in excess of 2500! This influx saw the need for us to increase the members of our team on the stand giving us the opportunity to network with a greater number of visitors over the 2 days. BPM 2018 gave us the opportunity to show the public along with current and potential customers that we still to this day support the mobile DJ community, constantly developing and introducing new and exciting products to the industry. Catering for a variety of budgets and setups we featured many of our popular fixtures alongside recent additions on our stand. The attention seeker of the show had to be the Equinox Midas Spot, people have always commented on this product but to actually see it in action this revolutionary moving head came into its own. Another product stealing the limelight was the extremely popular LEDJ Rubix Panel, with the retro vibe making a comeback in recent months this fixture is bang on trend. It really made an impact on the stand and was complemented well by the LEDJ Mood Bars. Other items featured included: Equinox Stratos series, Equinox Truss Booth, Equinox Hypnos, LEDJ QB1 uplighters, Equinox Aztec, Equinox Tri Power Batten and many more. We, the Prolight team, received great comments from DJs and Artists who use Equinox and LEDJ products every weekend, with further feedback from our customers who were impressed with the expanse of products we have available for the mobile market. It certainly was an exceptional show with fixtures such as the Equinox Vortex and Shards proving to be popular with high numbers making it to market by all retailers shortly after the show. We look forward to the official dates of the 2019 show to be announced and are excited to be part of the reinvented BPM in the future!